WARNING - Never keep oily, sticky eatables on a newspaper.Very poisonous LEAD dye will be ingested by and you are likely to have LEAD poisoning due to black printing dye! The cutlet is kept on newspaper to make it visually appealing. Please change the main photo.Keeping a good product on newspaper which has lead!! !.Atleast put it on the top of a tissue paper which will also absorb excess oil. I am sure, I will try this soon. Looks simple! Thanks! fall in love with the first picture :) amazing ! 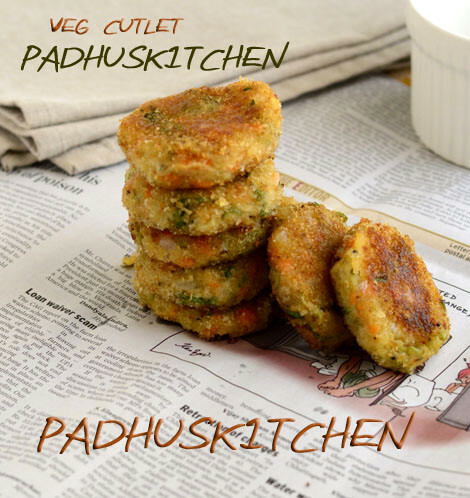 Perfect cutlets for an evening snack with a cup of chai! They don't look oily at all, just right. Mouth watering cutlets looks yummy. What really is a muslin cloth? Muslin cloth is a thin loosely woven cotton cloth used for fine straining purpose or to line a sieve.You can even use any thin cotton cloth for that purpose. I did not prepare bread crumbs, I just saw the recipe of bread crumbs... Is it possible to do without it? Hey that a gr8 idea to boil the veggies for cutlet. I will definitely try this method. Thanks for sharing and ur cutlets looks yummy. The good thing is its low fat too. good way of cooking vegetables. i had the problem to keep it dry. i ll try this definetely.my son loves all ur recipes.i used egg white instead of cornflour. which one will be more crispier? If we don't have bread crumbs is there anything to replace? In case you don't have bread crumbs, you can use sooji to to coat the cutlets, but then you have to be very careful while frying because sooji can burn if put on high temperature for long time, just keep turning over the cutlet carefully and you will be safe. I have used sooji and I don't find much difference. Enjoy! ctually i want to confirm thid that here we will use which cornflour?? I have used white cornflour. You can see the color in the picture. Mam I had some difficulty while dipping the flattened cutlet balls in corn flour paste. Wat would be the problem pls help. It broke while dipping. It must be due to moisture or water content in the vegetables.Try this- Instead of making cornflour paste, add a tbsp of cornflour to the vegetable and potato mix, mix well and then coat it with bread crumbs and shallow fry. Can we bake the cutlets in oven, if we can at what temperature and how many minutes. Do we need to preheat the oven. Dear Padhu, I literally followed the steps mentioned by you and what a HIT it was with my wife and son! They couldn't believe I could cook so well! Thanks. If you do not add water inside the pressure cooker, it will burst and the ruin the safety valve. You have to add water inside the cooker but do not add water to the vessel in which you have kept vegetables. I have written it clearly and you can also see water inside the cooker in the picture. See the picture in which I have kept chopped vegetables in a vessel inside the cooker. Hi, Is cornflour important to this recipe or can I not use it or could I use a substitute? Yes, it is used for binding. Hi, can we freeze/refrigerate the patty and shallow fry it the next day? Yes, you can freeze or refrigerate the cutlets (patty) and shallow fry it the next day. Do not keep it for more than a day as we have added vegetables. Can all purpose flour be used instead of corn flour? Am planning to prepare cutlets for a party with 30 ppl. Can you help me with the measurements? Yes, you can use all purpose flour. This measurement will give you 8 cutlets, so you plan accordingly. Hi, is there a way to make these cutlets without potatoes? WHat else can I use to bind the veggies? i tried they came out awesome. I surprised my husband with vegetable cutlets today. It was so yummy that we both emptied the plate soo quickly ��. My mixie wasn't working. Hence I tried hardening the bread in the microwave oven and then powdered it with hands. Thanks a lot for sharing such wonderful recipes. If there is moisture in the vegetables, the cutlet will not hold together. That is the reason I pressure cooked the veggies in a vessel without adding water in it. Even after that I squeezed out some water from the vegetables.You can add little bread crumbs to the vegetable mixture also as the bread crumbs will absorb the moisture. I liked ur recipe photos. They give a homemade recipe feel, which is why i like them. Just wanted to know one thing. If you don't have bread crumbs, what can u use instead? I have corn flour at home. So after dipping the cutlet in corn flour, how should i fry it without bread crumbs? Coarsely crumbled corn flakes or oats can be used as a substitute for breadcrumbs when making cutlets or you can blend a bread slice and add it to the cutlet mixture and make cutlets. It said to use beans, what kind of beans do you use? Also you said to use green chili, what variety, is it fresh or dried chili that you are using. I would love to make this for my son Rohan. I remember having them in college but have never tried making them on my own. Hi, can I use eggs as a binding agent instead of corn flour paste? Yes, eggs (beaten eggs)can also be used as a binding agent. Came out very well!! Yes, there should not be any moisture in the veggies..
Thankyou soo much for the recipe. But i had some difficulty with cornflour so i used maida instead. If there is too much moisture, try squeezing out as much water as you can from the vegetables using a cloth. I tried this recipe and it came out well.There was one problem where I was not able to break the cutlet properly after serving.The outer layer was crispy but it was mushy inside.what could be the issue? You must fry the cutlets on low heat. Your problem is- the outside is cooked well but the inside is not cooked properly. Can I use sooji instead of breadcrumbs for binding? You can powder oats and use it instead of sooji.